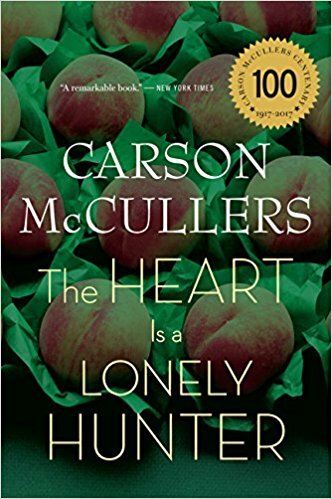 For this next book club, we are back to a classic – The Heart is a Lonely Hunter by Carson McCullers. The date for the next meeting is September 30th (a Sunday), here at Throwback Brewery at 1pm. With the publication of her first novel, The Heart is a Lonely Hunter, Carson McCullers, all of twenty-three, became a literary sensation. With its profound sense of moral isolation and its compassionate glimpses into its characters’ inner lives, the novel is considered McCullers’ finest work, an enduring masterpiece first published by Houghton Mifflin in 1940. At its center is the deaf-mute John Singer, who becomes the confidant for various types of misfits in a Georgia mill town during the 1930s. Each one yearns for escape from small town life. When Singer’s mute companion goes insane, Singer moves into the Kelly house, where Mick Kelly, the book’s heroine (and loosely based on McCullers), finds solace in her music. Wonderfully attuned to the spiritual isolation that underlies the human condition, and with a deft sense for racial tensions in the South, McCullers spins a haunting, unforgettable story that gives voice to the rejected, the forgotten, and the mistreated—and, through Mick Kelly, gives voice to the quiet, intensely personal search for beauty. Richard Wright praised Carson McCullers for her ability “to rise above the pressures of her environment and embrace white and black humanity in one sweep of apprehension and tenderness.” She writes “with a sweep and certainty that are overwhelming,” said the New York Times. McCullers became an overnight literary sensation, but her novel has endured, just as timely and powerful today as when it was first published. The Heart is a Lonely Hunter is Carson McCullers at her most compassionate, endearing best.